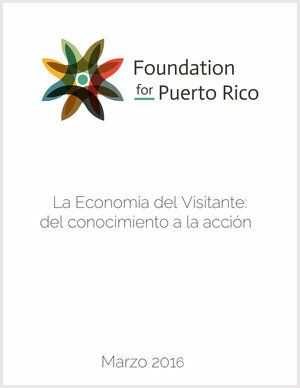 Tourism is one of the fastest growing economic activities globally and represents for Puerto Rico, facing a financial crisis, one of the most significant opportunity for economic growth in the short and medium term. If it is raised to a national priority as an economic strategy, it can support an accelerated growth that would change the economic trajectory of the Island. To develop a common language, the first part of the document is dedicated to clarifying concepts and definitions of tourism. Likewise, it provides context to the exposed data and introduces the idea of the Visitor Economy, with the purpose of encouraging the understanding of the impact that tourism offers inside and outside the sector. Finally, this document calls for concertation. The elaboration of a coherent and effective strategy with public policies for the development of tourism must be worked in an integrated manner, inserting all the elements that affect the growth of the sector and the economy in general. This will help to engage more actors to develop strategies and will also highlight the importance of tourism in Puerto Rico’s economy.